The Suzanne Dworak-Peck School of Social Work at the University of Southern California is one of the largest centers for social work, nursing education, and research in the world. With the design of its administrative offices, newly relocated to a high rise in Los Angeles’ City Center, the school saw the opportunity to integrate its subdivisions under one roof, resulting in an airy, collaborative, and modern facility. Working with the architecture firm Ware Malcomb, LA-based Knoll dealer Associates Purchasing, and interior designer Diane Lam, the school was drawn to the exceptional fit and finish of Knoll products, as well as the holistic, resourceful approach of the design process. The collaboration resulted in a stunning solution that encompasses private offices, meeting rooms, and lounge areas across 20,000 square feet. Attuned to the pedagogical goals of the School of Social Work, the project foregrounds opportunities for increased workplace well-being and active employee engagement. The design team harnessed the flow of natural daylight to allow sunlight to penetrate the inner rooms, emphasizing spatial fluidity and eased connections between different parts of the office. Allowing both faculty and staff the ability to be flexible with their work environment, the School includes adaptable board rooms that can be used for formal meetings, casual discussions, or training sessions. Generation by Knoll® Chairs offer ergonomic comfort while fortifying brand presence through material finishes and KnollTextiles upholstery that reflects the school’s color scheme. 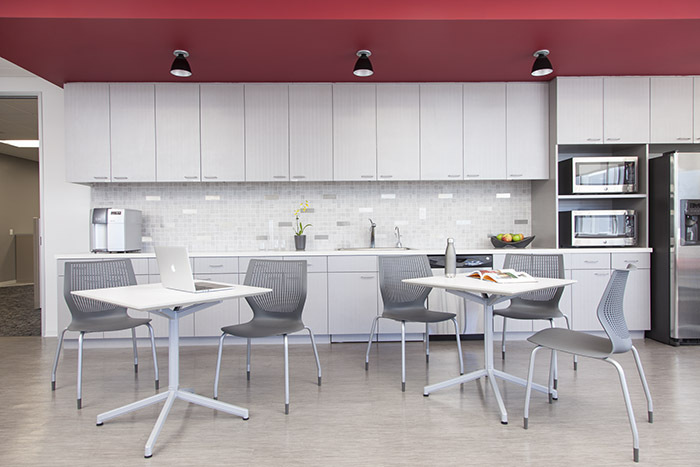 The muted red, gray, and white tones of the interiors are similarly echoed in the bases of MultiGeneration by Knoll® Chairs and the seats of Saarinen Executive Armless Chairs, which create a professional yet welcoming aesthetic. To meet the requirements of the various activities taking place within the school, an array of Knoll products were specified, each with their own benefits. For the private offices, Reff Profiles™ Peninsulas provide ample desk space, while Calibre® Lateral Files add increased storage capacity. Pixel™ C-Leg Desks with casters offer the opportunity for larger seminars in the multipurpose room, and can be folded and nested when not in use. In the break rooms, smaller Pixel™ Square Tables are well-suited to more intimate lunchtime encounters. The consistency of Knoll design across the School of Social Work results in a space that is unified and optimized, without being overcrowded. From Womb Chairs in the reception areas to individual Dividends Horizon® workstations, the project provides a comprehensive range of workspaces for faculty and staff to further their goals in the realm of social work and to work together more closely. By standardizing the furnishings with a careful selection of Knoll products, the institutions becomes well-poised for future program expansions and inevitable technological updates, all while fostering a cohesive and flexible environment for its people.